A nice friendly reminder from PULMCCM that we need to pay attention to infection control. Clean those stethoscopes! If you need guideance from the CDC, PULMCCM is kind enough to link to the 161 page study by the CDC on disinfecting guidelines. Seriously. 161 pages. I didn’t read it. But I will be paying more attention to making sure I grab those sani-cloths after every auscultation. This is where the ANDROMEDA-SHOCK trial comes into play. You can read all about the possible ramifications of this trial here on emDocs. Can a simple capillary refill test be a better marker for treatment efficacy than serial serum lactate measurements? The answer is: probably. And this is important – because what is means is that we may be able to potentially use another tool/marker – and ditch the high volume fluid boluses used to flush lactate during sepsis treatment. I wonder when we will get a tie in from my favorite sepsis treatment protocol skeptic Dr. Paul Merik? Early clinical signs of HE can be insidious and include small personality changes such as sleepiness, apathy and loss of inhibition. There is an entire paragraph on the use of ammonia levels and it’s use as a diagnostic criteria. This paragraph alone is worth a serious read. Suffice it to say that ammonia alone is a poor diagnostic tool for HE. The article stresses the importance of paying close attention to serum sodium levels and possible dehydration as precipitating factors to HE. There is a great breakdown of the pathophysiology behind both processes. St-Emlyn’s talks about P-Values and what they mean. If you like to read medical trials and don’t pay attention to p values, you really need to listen to this lecture. This is a great little podcast. It is only about 11 minutes long – but it packs a real punch in that it can really hone your ability to figure out what literature can be useful in your nursing practice, and what is just “good enough” to publish – but not necessarily applicable to your clinical setting. Null hypotheses – states that there is no difference between two treatments. Testing the null hypothesis shows that there may actually be a difference. the magical value of 0.05 – why it matters and why it doesn’t. What is a fragility index? Why is this important in context of p values? Why statistical relevance isn’t as important as clinical relevance. emlitofnote.com has a pretty good write up on fragility index here, as well as a good explanation as to why, perhaps, a lot of recommendations from the EM studies we see may not be implemented any time soon. The article on emlitofnote.com is in reference to this article in Annuls of Emergency Medicine which found that the average fragility index in 180 randomized EM trials was only 4. Ouch. For those of you that are bad with statistics (like me…), what this simply means is this: if you were to take 4 patients and switch their results in a trial, you would get the opposite result for the trial. Fragile indeed. To put this another way – lets say we have a trial testing whether a certain dose of Epi is helpful for hypotension. 400 pt are enrolled and make it into the trial. So n = 400. Lets say the trial shows that the dose of Epi is indeed effective – the p value is 0.05 but the fragility score is 1. That means that if only 1 of the 400 patients had a different result, the entire trail would have the opposite outcome. Fragility index is important specifically because it helps us look beyond p values. EMCRIT podcast #241 goes over more on the ANDROMEDA-SHOCK trial as well as the CENSER trial. Scott Weingart always has a lot to say about sepsis treatments – his take on the ANDROMEDA-SHOCK trial is interesting, and his breakdown of the CENSER trial is pretty spot on. I always advocate for early pressor use in my sick sepsis patients – but let’s be honest – there is a lot of fuzziness out there concerning pressors in the ED for septic patients. Which one to use, how early, what dose, which patients really need it, does it decrease hospital stays, etc etc etc. The CENSER trial is great because it gives us a low-risk, one size fits all solution. Low dose norepinephrine for our sick ED septic shock patients (define shock as MAP <65 in this studies population) to reduce mortality. Sounds too good to be true? Take a listen and see what Scott says. Just in case you were interested, more on the CENSER trial here at The Bottom Line. As usual with The Bottom Line, the “strengths and weaknesses” portion of the review are incredibly helpful – especially when concerning the clinical external validity of a single center trial done in a relatively low ICU resource hospital. Also, this just in from our friends at ALiEM – you need to hug your EM residents and tell them that you love them more. Seriously though. 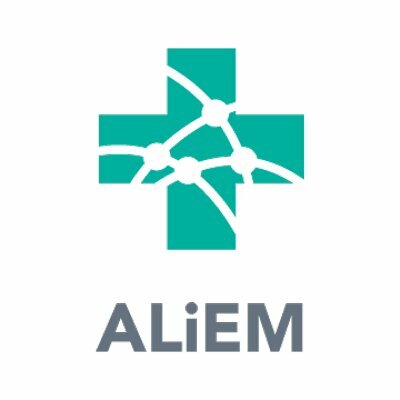 Also, in the increasingly strange meta world of medical literature and publishing – ALiEM submitted their study to Annuls of Emergency Medicine and the FOAMed study was published in the print world. Taming the SRU brings us possibly the most information packed article in the FOAMed pack this last month with their discussion of the CBC. While this article may send you down a wiki black hole in search for definitions of diseases and abbreviations you may not remember – it is truly amazing if only for the infographic put together by someone who deserves a round of beers from all of us who will be pouring over this graphic for the next few weeks. I would estimate that about 100% of the patients I grab labs on get a CBC. If you are like me and only do a cursory read of the results from this lab, this article is for you! If you work in a trauma center and are familiar with REBOA usage you might be in store for a bit of a sea change when it comes to the paradigm behind REBOA usage. REBELEM shares a post on why REBOA utilization may be getting a fresh look. Zaf Qasim of University of Pennsylvania school of medicine writes about JAMAs article: “Nationwide Analysis of Resuscitative Endovascular Balloon Occlusion of the Aorta in Civilian Trauma”. The study’s conclusions may be sensational, but don’t just skim through. Read JAMAs article but make sure to then read Qasim’s careful analysis. Long story short here: “placement of REBOA in severely injured trauma patients was associated with higher mortality compared with a similar cohort of patients who did not undergo REBOA placement.” But, per usual, there is a lot of nuance that can be missed when one just reads through an abstract and then skims the conclusions. There are 8 separate bullet points in Qasim’s analysis of the JAMA article that are very worth a thorough read. Either way – if you use REBOA in your trauma bay, this is a great bit of FOAMed worth sharing. © 2018 - Code Blue LLC. All rights reserved. – Website Design by MVfolio.